HISIERRA™ bags are one of many recent inventions made possible by the wave of cannabis legalization that’s swept the U.S. in recent years. 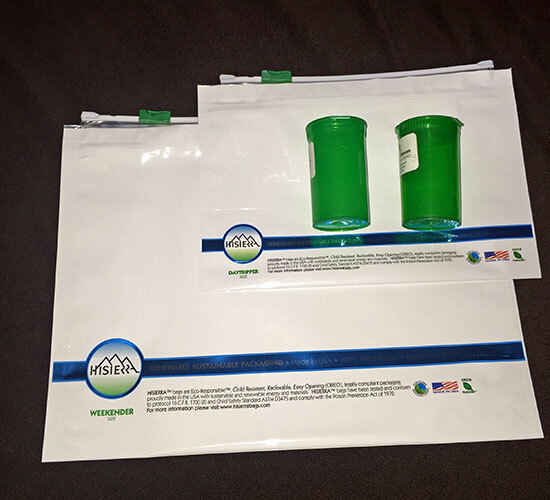 Designed specifically for use in legal cannabis, HISIERRA™ bags are a sustainable, reusable, renewable and responsible child-resistant packaging solution that will prove useful for anyone in the business of dispensing medical cannabis — from the eco-conscious backyard caregiver to the dispensary owner whose main concern is staying state-compliant. The bags themselves come in two size categories. The smaller size, called the ‘Daytripper,’ is 9″ x 6″ in dimension; this bag could easily hold up to a quarter of an ounce of flower — or much, much more if you’re willing to squash some nugs. The larger size, a.k.a. the ‘Weekender,’ is 12″ x 9″ and has a 4″ wide gusset base; for the dedicated cannabis consumer, this bag could carry several ounces. In your hand, the bags feel sleek and sturdy. Aesthetic-wise, the bags are fairly minimalistic, though custom printing options are available on request, according to the company website. 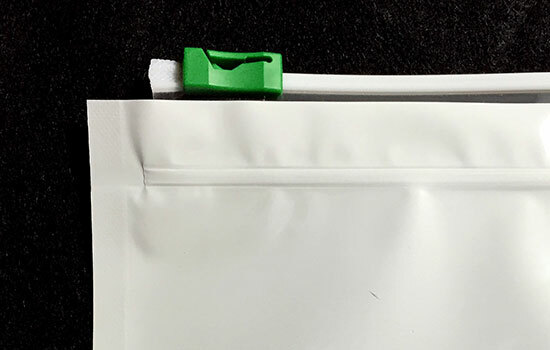 The bags’ locking mechanism is very functional: the zipper slides back and forth easily at the top of the bag, but to access the contents inside you must push the zipper’s tab down into the bag’s seal. Under the Consumer Product Safety Commission Protocol and Standards, HISIERRA™ bags are certified “Child Resistant” under protocol 16 CFR 1700.20 and the Child Safety Standard ASTM D3475 and fully comply with the Poison Prevention Act of 1970. Each pouch is also food-safe verified. To determine how well the bags can contain strong odors (an important factor for patients who must carry their cannabis with them throughout daily life), our testing team filled an HISIERRA™ bag with the skunkiest product we could find and placed it inside of a personal backpack. We couldn’t detect any odor leakage in the backpack after more than an hour of storage. HISIERRA™ goes beyond bio-based resins and eco-friendly material sourcing, however, because the entire HISIERRA™ production line is powered using 100% renewable, wind-sourced electricity. The factory is LEED certified Silver. “The air coming out of our factory is cleaner than the air coming in,” Greenfield jokes, but his emphasis on sustainable, renewable and Earth-friendly business practices is very real. HISIERRA™ bags are available in dispensary boxes, which contain 60 bags each, or in a master case, which contains 7 dispensary boxes (or the magic number of 420 individual bags). 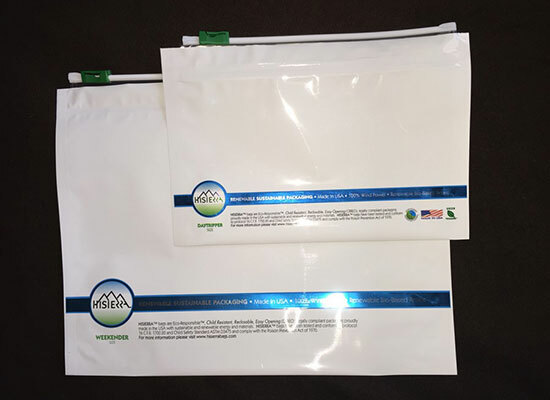 The company is currently working to create smaller bag options to better serve the concentrates and edibles side of the industry. You can learn more about HISIERRA™ bags at www.hisierrabags.com or reach out to Mike Greenfield directly at mike@hisierrabags.com. We love seeing cannabis entrepreneurs put their ingenuity to work to come up with products that set a good example for the industry as a whole, and we’re excited to see what HISIERRA™ does next! 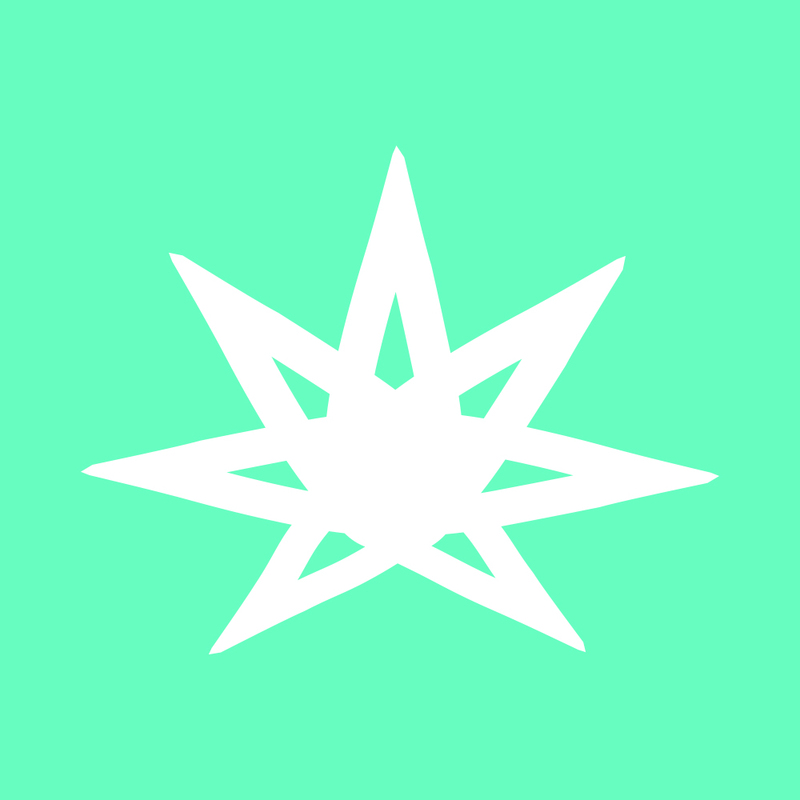 Ganjapreneur Product Announcements and Reviews provide you with an opportunity to learn about cannabis-related products that you may not normally come across. We only write about products that are worth a moment of your time to check out. If you’d like to let us know about your product, email us at grow@ganjapreneur.com. We cannot reply to every email but we do read them all.